Two judges on the DC circuit court have just ruled that Obamacare subsidies obtained through federal (rather than state) exchanges are not authorized by the original wording of the law. This affects up to five million insured persons in the US, putting them, for the moment, in a legally precarious place. Huffington Post is declaring the end of the world (or at least of Obamacare). Drudge has relegated the story to the upper left-hand corner, suggesting that he may not think the setback to be a lasting one. Whether a death-blow or a bump in the road for what is essentially the federal implementation of "Romneycare" (I lean toward the latter, as bad legislation is hard to kill), the astrology of the day gives us some clues. OK, the progressions don't tell us much, though it will be interesting to see what happens when the progressed Moon hits the IC in about three to four months. Transiting Retrograde Pluto square Obamacare Mercury: the threat of death (Pluto) through language (Mercury)? Perhaps we won't know until the final direct Pluto square in this series in November whether or not the threat is genuine. Transiting Chiron conjunct Obamacare Jupiter in the Tenth House: Broken-ness and weakness (Chiron) made public (Jupiter in the Tenth). 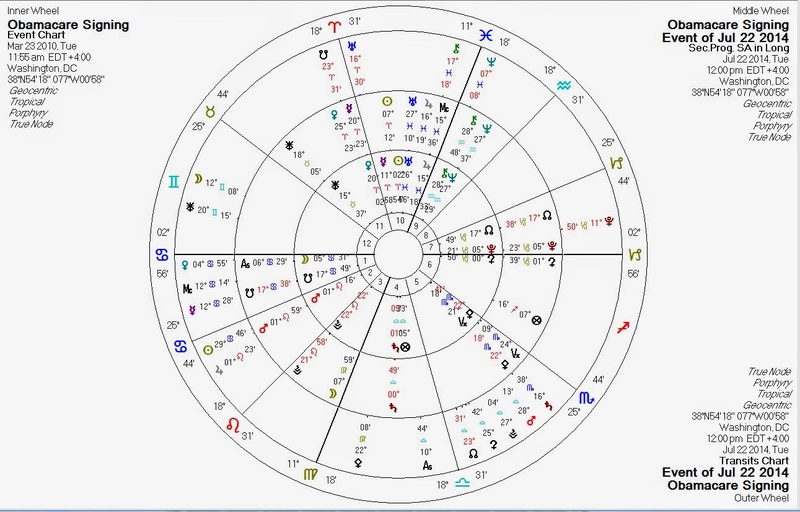 Transiting Stationary Direct Saturn trine Obamacare South Node: a development regarding structure/authority (Saturn) resulting in loss (South Node). Transiting Sun and Jupiter conjunct Obamacare Mars: public (Jupiter) battle (Mars). Transiting Pallas sextile Obamacare Pallas: Pallas represents non-aggression -- forced wealth distribution systems such as Obamacare are, from the point of view of Pallas, a type of aggression. So when Pallas is strengthened by transit, authoritarian entities tend to weaken. The Pluto and Pallas transits are particularly close to exact today; the Saturn station is also of particular interest. Libertarians, of course, are all for making health care services available; they just don't believe in "robbing Peter to pay Paul" to do it. Left-wing Obamacare supporters and Right-wing detractors generally try to ignore the law's origins in the American Right. AnonymousJuly 23, 2014 at 2:21 PM Those of us on the right would argue that Romney isn't here with us--particularly on Romneycare. In fact those millions of voters who stayed home during the last election might cite Romneycare as one of their main reasons for doing so. ReplyDelete AnonymousJuly 29, 2014 at 8:24 AM Romney care, something that occurred in one state only does not translate to all of the GOP or conservatives. So to connect Obamacare to the GOP as a whole is a bit of stretch don't you think? The Constitution does not guarantee the "right" to healthcare. Get rid of trial lawyers, sell across state lines and get the government out of our lives, that is the key. ReplyDelete Replies astrolibertarianJuly 29, 2014 at 8:53 AM Before it was called "Romneycare", it was another GOP initiative. I seem to recall that the Gingrich camp was trying to push it through. The GOP actually rarely cuts anything: instead, they talk about cutting while actually doing exactly the same things as the Democrats. But yes, of course, get the State out of medicine. And everything else.